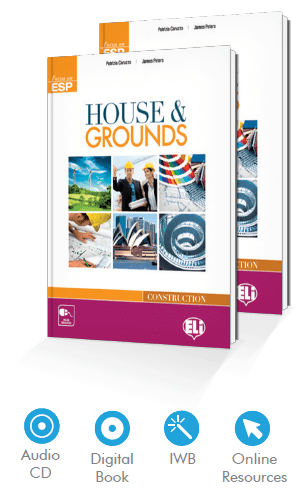 House & Grounds develops the English-language skills required for a career in today’s construction, design and environmental industries. The course offers area-specific information through a wide variety of text and exercise types alongside a solid syllabus of grammar revision and vocabulary development to enable students to reach the required level of competence. 9 Modules focusing on the environment, urbanisation, bioarchitecture, building materials, design and planning, plumbing, heating and electrical systems, public works and jobs in the construction industry. 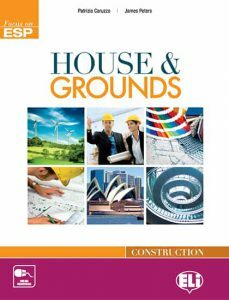 Descriptive texts introduce technical words and provide the basics of building science. Authentic and adapted articles practise reading skills. Careful grading of topics, grammar and vocabulary: Focus on Language. Extensive use of photographs to ensure understanding of technical aspects of English for construction. A Short History of Architecture: from Stonehenge to the Millau Viaduct. Famous Masterpieces: from Canada to the United Arab Emirates, from India to Britain and the USA. All the resources of the coursebook in interactivedigital version. Link to full, online user’s guide. Ideal for “heads-up” lessons on the IWB. Extensive teaching notes for each section. Answer keys and transcriptions of listening materials. Tests and extra resources for both stronger and weaker students. CD-ROM Test-Maker with editable tests in Word© format.